There are various procedures to treat, support or prevent injuries either resulting from sports or everyday activities. Taping has proven to be an effective method both in aiding prevention and injury rehabilitation and recovery. There are a number of different products available as well as a variety of techniques that are used to help protect the joints, ligaments and tendons. 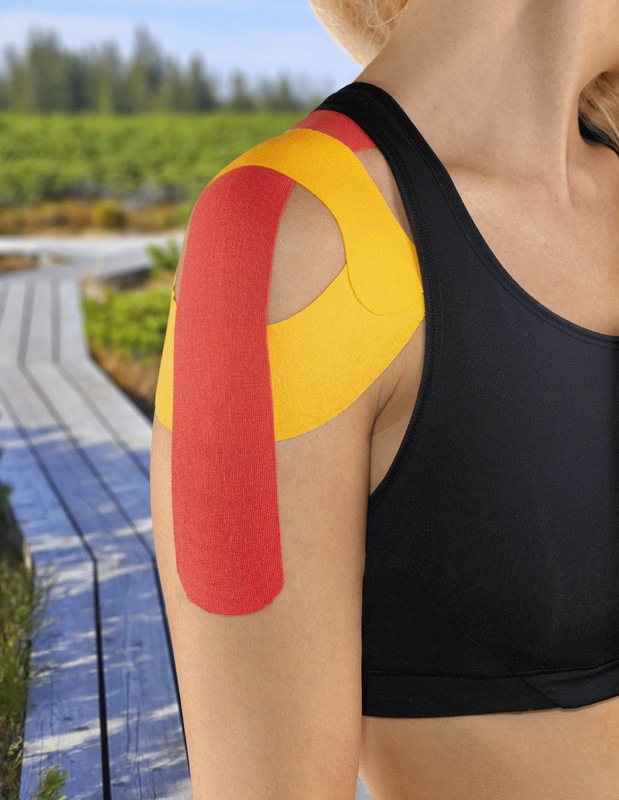 Because there are different muscle tape products to choose from, it is important the proper one is selected to treat one's specific muscle injury. As well, the proper application of each technique may be different depending upon your need. At Academy Massage our therapists are trained and knowledgeable in prescribing and applying the taping technique that is the right fit for you, by assessing the type of injury you are trying to prevent or to promote recovery. Taping is often used in sports and athletic competition to support weak or athletically compromised joints, injuries that can result in shin splints, ankle sprains, knee joint injuries, shoulder and elbow problems and even wrist and thumb manipulation. Athletic taping allows for an extension of activity through a lessening of stress on the injury, ultimately relieving the associative pain and discomfort, and increasing mobility. At Academy Massage our specialists employ therapeutic taping to relieve pressure on swollen or injured soft tissue to provide support during healing. This is designed to promote the body's natural healing process. Massage therapy performed by our skilled professionals can also be used in conjunction with taping for the treatment of soft tissue injuries to beneficial effect. Oftentimes euphemistically referred to as tennis elbow, tendonitis is a particularly painful inflammation of the tendon that generally is a chronic condition common in the upper and lower limbs. A tendon is a thick cord of fibrous tissue that connects muscle to bone. There are hundreds of tendons throughout the human body but in most cases only specific tendons are prone to cause problems. Tendons have limited blood supply and can be easily damaged through strain or repetitive or overuse and may result from a broad array of activities, ranging from gardening to sports. While occurring most frequently in those in the 40 to 60 age range, the condition can affect anyone as tendonitis may also be associated with an inflammatory condition, such as rheumatoid arthritis, or may occur as the result of an injury. In severe cases the pain can be almost debilitating and function of the affected area may be limited. Acute tendonitis may lead to chronic tendonitis (called tendonitis or tendinopathy) if the person does not adequately rest the joint or if the person continues to overwork the joint while experiencing symptoms. Rotator cuff tendonitis is a common form of tendonitis characterized by pain in the shoulder, the shoulder tip, and upper regions of arm. This pain tends to get worse with activities like pulling, pushing, lifting, or even simply reaching. Other symptoms associated with rotator cuff tendonitis may include tenderness and swelling. There are many treatments for tendonitis intended to heal the injured tendon, such as restricted activity, rest, elevation, compression, the application of ice on the affected area, and anti-inflammatory medications. Surgery may also be performed in extreme cases, but usually as a last alternative. Massage therapy has been proven effective both to accelerate the healing of tendonitis as well as providing excellent treatment for the pain and discomfort associated with the condition. Massages are considered to be one of the best methods for increasing blood flow to the injured area, thereby increasing oxygenation and speeding up the healing process. Massage for tendonitis helps to relieve excessive tension and facilitates the reduction of scar tissue (which restricts mobility) with hands-on manipulation of the affected area. Icing may also be done before and after massage to provide pain relief. The staff at Academy Massage are experienced, licensed massage therapists who can assess your condition and recommend the massage techniques that are right for you. We offer a variety of massage styles that incorporate elements of cross fiber and active release techniques to relieve tendonitis. Deep tissue massage has been shown to provide the most benefit for treating tendonitis. The treatment involves the stimulation of a ligament or tendon to mobilize it as much as possible. Deep tissue massage, when performed before active exercise, can help reduce the pain associated with tendonitis and restore mobility. This type of massage therapy is particularly effective in cases of soft tissue injury. Academy Massage advises that massage therapy should not be administered during the acute stage of a tendonitis injury (which is typically the first 48 hours after injury). As well, massage therapy should not be performed when tissues are swollen or visibly inflamed.